Looking after the Big Shot! I have a Big Shot and because it wasn't a cheap piece of equipment I like to look after it. It has to last me a long time, and so do the dies I buy to use with it. To keep it safe I store it in a drawer along with the dies,and that way I know they are all together whenever I need them. I enjoy putting die cuts onto my cards as it is a quick way to add toppers, and they can be used over and over again. I even make them up into packs of stars, christmas trees, sentiments, flourishes and I take them to my local charity shop for them to sell. Always a welcome donation at this time of the year. Storing your die cutter close to hand is an excellent idea, and that way you will get to use it more often. It is a useful piece of equipment and they aren't cheap, so they need to be taken care of. 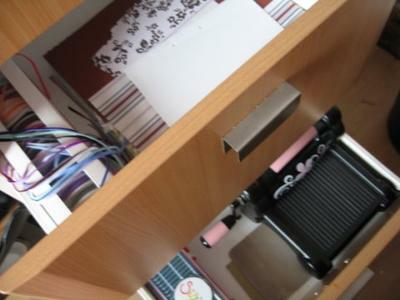 I found drawer space for mine too, instead of rummaging in the cupboard, and having to move things to get to it. And then having to put everything back again after. This way I just open the drawer and there it is.